This is my last post as the Fair Trade Intern on campus. I graduated Penn State Brandywine on December 21st and will be moving on with life. This semester as the Fair Trade Intern has meant a lot to me. I feel closer to my school more than ever. A lot of great things were accomplished and I hope next semester goes even better. The Fair Trade movement on the Brandywine campus grows all of the time and I have faith in our students, faculty, and staff to continue its growth. Thank you to Pam and Nick from the cafeteria for helping get Fair Trade food on campus. Thanks to Prof. Olear and her students for helping out at our Go Bananas and Fair Trade T-shirt Swap events. Thank you everyone who helped us this semester, and to everyone that participated in our events, we could not have come this far without your support, and thanks to Dr. Guertin for getting me involved in the first place. I will certainly miss working on campus and helping to make it a better place. I hope whoever fills my spot as the Fair Trade Intern will know just how lucky they are to work with such great people for such a great cause. If you did not make it to the Media Theatre on the evening of December 17, please allow us to share a recap with you of a very special evening. On this chilly Monday evening, Labanya Mookerjee and I headed to The Walden School‘s Holiday Sing-A-Long to hear the preschool, elementary, and middle school students perform some beautiful songs. We thoroughly enjoyed hearing these children and seeing them perform songs such as Have a Holly Jolly Christmas, Santa Claus Got Stuck in My Chimney, Hanukkah Festival, and The Peace Song. But looking down the front row of the theater, anyone in the Fair Trade community would have known that something else was going to happen this evening – something significant, something exciting! Seated down the row were myself and Labanya of Penn State Brandywine, Elizabeth Killough of the Media Fair Trade Town Committee, Hal Taussig (Media’s Fair Trade pioneer), Mary Le Fever (Walden School’s founder), Monica Simpson of the Media Borough Council… and the list goes on! The evening started with Walden’s Head of School, Mary McKeon (pictured above, left), and Assistant Head of School, Carly Tolson (pictured above, center), making an announcement that (drumroll, please….) The Walden School has been officially granted status as the nation’s first Fair Trade School for pre-K through 8th grade! Monica Simpson came on to the stage to make the presentation of the official certificate from Fair Trade Universities (who oversees all school campaigns). To view a video of the Fair Trade announcement, please click here. Congratulations, The Walden School! Penn State Brandywine looks forward to connecting and collaborating with you on future Fair Trade awareness, education, and advocacy events. Our bookstore has your Alta Gracia holiday gift! 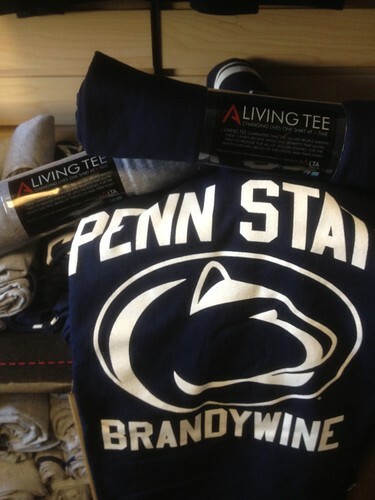 If you are still looking for a holiday gift for family/friends, swing by the Penn State Brandywine Bookstore (hours and location) and grab some Alta Gracia t-shirts! If you can’t get to the bookstore, you can also order online. 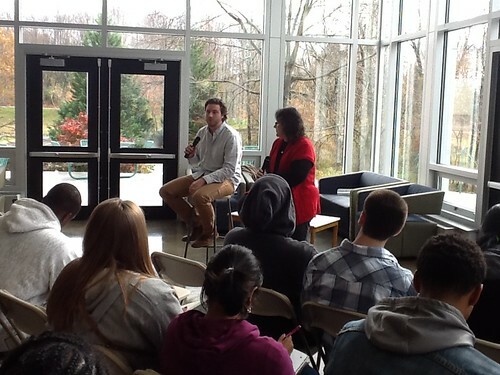 Hand In Hand Soap talk @ Penn State Brandywine! 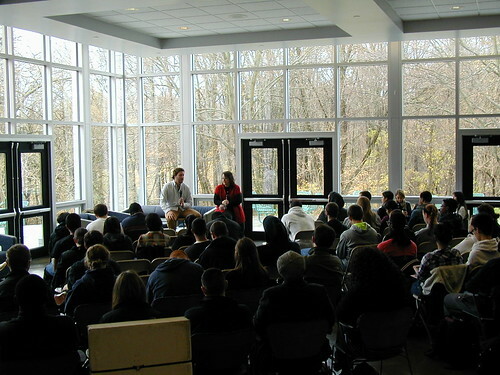 On Tuesday, November 13, at 11:30AM in the Tomezsko Classroom Building at Penn State Brandywine, co-founder Bill Glaab from Hand In Hand Soap came and talked to our students about his company. Hand In Hand Soap is a specialty soap company that uses Fair Trade ingredients in its product, and donates a bar of soap to a child living in Haiti every time you buy a bar of their high quality products. Bill and Courtney Glaab started Hand In Hand Soap less than two years ago, and the company has been growing ever since. Hand In Hand Soap focuses on donating their soap to Haiti because of the damage done to the country’s infrastructure as a result of recent natural diasters, including Hurricane Sandy. Because clean water is such a hard resource to have access to right now in Haiti, hygiene is extremely important when it comes to staying disease-free. And the worst part is the people who often suffer the most are children, with death tolls extremely high due to things like cholera which could be prevented with something as simple as a bar of soap. It is Hand In Hand’s vision to one day extend their reach to all parts of the globe in need. Bill’s presentation at Penn State Brandywine focused on how Hand In Hand started and the company’s mission of providing people with sanitation challenges with the basic means to live healthier lives. Students also picked Bill’s brain for details and asked questions including how to run a small business such as his, what it has meant to him to be involved in such an impactful organization, and how do you manage to work side by side with your significant other. Bill was very open and rewarding as a speaker, he was not afraid to talk about past mistakes and life changing moments in his career. Afterwards Bill sat down and had lunch with a small group of us while we casually talked about the influence of people like him and his wife. I think everyone walked away with something valuable after meeting with Bill, whether it was marketing tips, learning about Fair Trade, or becoming inspired to do something great yourself. Thanks to Courtney and Bill for helping further spread Fair Trade.